Call before you go to be sure these groups are still active. Also, we have started an informal ADOPT-A-LIBRARY program to assist libraries with their after-school and summer programs to teach adults or children how to knit or crochet. Please contact your neighborhood library and volunteer. 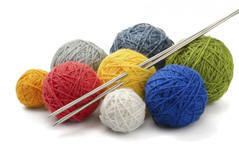 For those who knit and crochet, bring your latest project and relax at the Library for a low-key evening of crafting every Monday from 6:30 pm to 7:45 pm. All Fiber Arts are welcome. This program is intended for adults only. Bring your knitting, crocheting and other handiwork. * Although knitting/crochet is not listed on the website, there is a librarian who is encouraging the activity in this time slot. There is plenty of free street parking, and Septa route #15 stops right in front of the door. Comment: There is a group of us knitters & crocheters who meet at the South Philly branch library (on Broad @ Morris) on Wednesday from 6 pm to close (8ish). We will be in the back towards the kid's section by the windows facing Broad Street. There are only a few of us now but more are definitely welcome. It's quite informal, a just show up and knit vibe. If you’re crafty, come hang out with us and make something! This is an informal get-together for neighborhood people who knit or crochet. Now meeting weekly! All levels welcome. About us: "Sisters Interacting Through Stitches" is a diverse group of women who crochet and knit items that are donated to local, national, and international programs.